Logic. It's the basis for making any reasonable conclusions in life. What you should eat in the morning, how you plan to get to work, and whether or not you should wear your shoes on your feet, or on your hands. It's important. Kirk knows it, despite some of logic-defying decisions. But that's why he keeps Spock aboard the U.S.S. Enterprise. Spock travels with the Star Trek crew to make all of the hard decisions. Without him, Kirk probably would have succumbed to some fool errand on a planet filled with giant snail aliens! 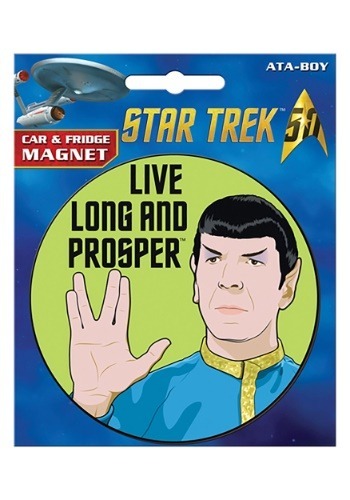 Spock is the voice of wisdom and now, you can have a constant reminder of his wisdom with you on your car. This Star Trek Spock magnet comes with the legendary Vulcan Lieutenant Commander's image on the front. he's flashing the classic Vulcan "V" symbol with his fingers and he comes on a bright green background. It also has the phrase, "Live Long and Prosper" above him. The magnet fits quite easily on your car or refrigerator. When you place this Star Trek magnet on your car, Spock will always be to give you a friendly reminder to adhere to logical decision-making!